Travel first aid kit is like an insurance, something we must have when travelling but hopefully we will never have to use it. Travelling with something we might not need seems to go against all the advice of travelling light. However if we do need it... then it can literally save our lives. That is why you should always make space for first aid gear in your luggage. What Should Travel First Aid Kit Contain? The name kind of says it all - the content should be aimed to provide first aid in the case of injury or illness. Of course, accidents and injuries can vary greatly and need different treatments but some basic things are useful in many circumstances, like bandages, antiseptics, and pain medicine. What the travel first aid kit consist of is very much the matter of personal choice. It should though take the trip itinerary, destination and size of the travelling party into consideration, e.g. solo traveler on a city break needs less kit than family of four on an adventure holiday in remote location. 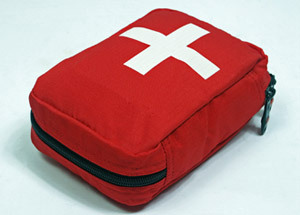 You can put together your own first aid bag or you can buy standard kits. Many travelers buy a standard kit for the basic items and then add their personal items to the kit, i.e. based on their personal needs (like prescribed medication) and their trip itinerary. Basic standard kit with your personal additions should be sufficient in most cases but if you are going on an adventure holiday off the beaten track you must adjust your kit accordingly. Classic first aid products like bandages, gauze, antiseptic, scissors, tweezers, cotton tipped applicators, etc. Pain killers, i.e. paracetamol / acetaminophen, aspirin, ibuprofen, etc. These lists are for guidance only, you should include in your first aid kit everything you feel relevant for you and your trip. It is important to check the content on regular basis and replace any items that have been used, are damaged or have expired. And don't forget, first aid kit is only useful if it is available. This means not only bring it with you on your holiday, do not leave it in your check in luggage / room when travelling... keep it with you. Ps. never travel without adequate Travel Insurance, taking the risk is just not worth it.